Legendary Pittsburgh sports reporter Stan Savran is currently in the hospital after undergoing quadruple bypass surgery. The Pens games already aren't the same so here's to a speedy recovery. The photo is from an old 1985 Pirates scorebook. 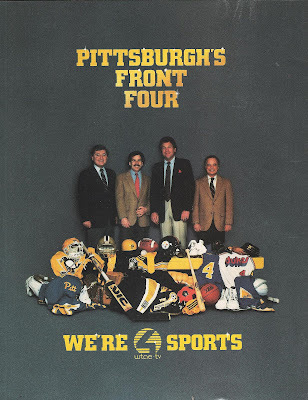 I have no clue who the first two guys are but either Stan is very tall or the WTAE sports department was very short. Get well soon, Stan! I'm pretty sure that Bill Hillgrove is on the left and John Steigerwald is between Bill and Stan. I only remember John being on KDKA, but he may have been at WTAE.